Romantic Gites in the Loire Valley - that we feel, really stand out from the rest. Our traditional lime-stone Loire Valley Gites are set in 5 acres of grounds, with shaded avenues of trees, mature conifers, exotic trees, lawns, shrubs, wall-climbers & all sorts of gorgeous flowering plants... the gardens are also integrated around the Gites swimming pool area. All our Gites cater for babies and young children as well as teens. For the young children there is a great in-ground splash pool: 5m x 5m & 20cm deep. 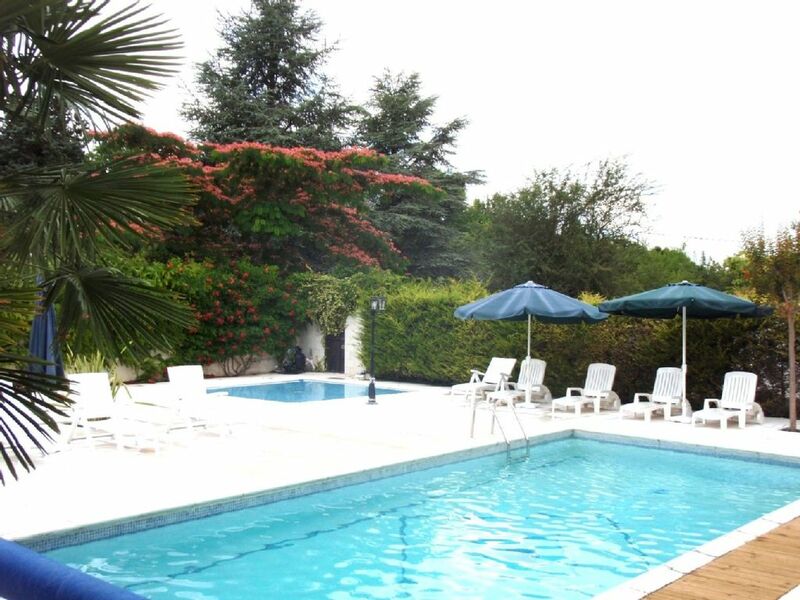 And a main heated swimming pool for the adults: 10m x 5m & up to 2m deep. The pool area is open from mid May to mid September. There are also many other activities on the grounds of our Gites, such as table tennis, badminton, football, swings & many garden toys for your children to enjoy. We travelled as a family of 5 adults, 2 children for 1 week in August 2017. Home is lovely, plenty of room inside the cottage, however most of the time we spent outside. Lovely garden, lots of kids toys provided in the gardens and a around the pool. Pool area was lovely and lots of space and seating for all 3 properties. Play area was good, however some of the equipment needs to be maintained a little better (baby swing). Grounds lovely for cool walks, close to village with Inn/pub for afternoon/early evening drink - about 10 mins walk. Overall a very relaxed family get away - not always easy with 2 kids!! Everything you could possibly want for a relaxing holiday, clean, tidy, peaceful, great for families, nice owners, safe pool area, plenty of things for kids to do in a beautiful garden. We will be returning. Thanks to owners J and A. Clean, tidy, beautiful location, owners were very friendly and helpful, overall amazing holiday - would highly recommend. The house was spotlessly clean and fully equipped - The garden Toys kept the kids amused for hours! Thanks - it gave the wife and I some quality time to enjoy a glass of wine or two! Beautiful quiet location...loved it ! Wonderful stay. The gite was very clean and tidy on arrival. Inside had everything we needed for a great holiday. The owners were geninuely friendly and made us feel very welcome. The grounds of the property were great for the kids. Excellent secluded location, quiet and tranquil, it was a much needed break for us. Would highly recommend this gite and we'd definitely return there again. Above average outside but lacking inside. and the rustic atmosphere of the property. I was also part of this group and feel it only fair to include the full review as sent to the owner. My two cleaners and i spend at least two hours on the changeovers with lots of bleach to make sure the house was spotless, the house was completely redecorated this year, and the kitchen is fully equipped and updated regularley,the bedrooms all have fans to help cool them in extreme heat, the private garden has a new 4mts by 3mts marquee for sunshade, with new teak table and chairs to sit 8/10 people and a new BBQ, we have a childsafe gate that leads onto a stunning 5acre landscaped garden ( not our words, but the words of most of our clients) and to the walled and gated very large and very clean pool area. See the reviews made about this house and our other two houses on the same site, to see that this is a very unfair review. Gites in Loire, farmhouse Gites set in five acres of beautifully matured landscape gardens in a lime stone Loire village named Cussay. A small and peaceful village about 28 miles south of Tours, 19 miles north-east of Chatellerault and 10 miles from Loches.